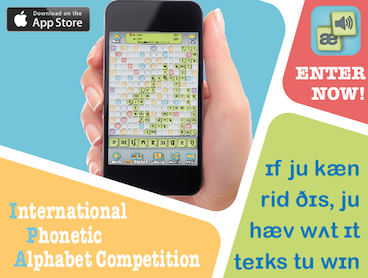 October 1, 2014 — Vancouver, BC: Tactus Therapy Solutions and LessonPix, the makers of Soundable, today announced a nationwide competition for students and professionals using the International Phonetic Alphabet (IPA). The competition, which runs from October 1 to November 30, 2014, offers a fun way to practice transcribing words using IPA, a critical skill taught in linguistics and speech-language pathology training programs. Soundable, a free app for iPhone, is a social crossword game like Scrabble but words are made by playing sound tiles instead of letter tiles. There are 41 sounds in the game: 24 consonants, 10 pure vowels, 2 r-colored vowels, and 5 vowel diphthongs plus 2 blank tiles. The goal of this year’s tournament, which is being held in conjunction with an app update, is to provide phonetics students with a fun way to study. • Random opponent: When linguistically oriented friends are scarce, you can still play by selecting this option. “While there are only 26 letters in the English alphabet, there are more than 40 sounds. Knowing the sounds and how they’re made — manner, place, and voicing — makes it easier to understand why a person may have trouble saying “child” /tʃaɪld/ but not “baby” /bebi/,” says Megan S. Sutton, MS, CCC-SLP (C), Tactus Therapy Solutions founder, app designer, director and practicing speech-language pathologist. To register for the contest or for more information, go to www.soundablegame.com.